Hong Kong Philatelic & Numismatic Company Limited (HKPNC, 香港郵幣有限公司) is founded by a team of specialists in philately and numismatics, who are passionate about our areas of expertise. Our vision is to apply our knowledge and love on philately and numismatics to promote them as both a unique pastime and as well as a medium of investment. Our mission is to encourage and contribute to the advancement of the science and practice of philately and numismatics, and also to enhance the status of Greater China in the world of philately and numismatics. In order to achieve our goal, we will initiate and coordinate new programs for the benefit of philatelic & numismatic collectors including knowledge exchange and educational workshops, which will enhance the pleasure and user-friendliness of both collecting areas. We mainly deal with stamps & postal history, coins & banknotes, modern bullion coins, vintage postcards & photos, and other kinds of collectables and antiques. We are guided by a core belief that our clients come first, and our stock offerings and service to our clients can be characterized by Expertise, Enthusiasm and Exclusivity. We are proud to offer an extensive selection of philatelic and numismatic items for direct purchase. Our stock ranges from "a penny" to gems for the connoisseur. Apart from our stocks displayed in our online store, we retain a large offline stock selection of quality items that can be viewed by appointment at our office. We also provide professional authentication, valuation & appraisal services, and free consultation for anyone who wishes to build his/her own collection or investment portfolio. Our extensive experience with both seasoned collectors and advanced investors would definitely make us your trusted partner and advisor. HKPNC is based in Hong Kong, which is a city with the greatest economic freedom in the world and also the centre of philately and numismatics in the Greater China region. Given China's status as the world's largest and most dynamic philatelic & numismatic market nowadays, and Hong Kong’s proximity to Mainland China and the rest of Asia, we possess the geographical advantage of being able to meet our clients in person throughout Asia on a regular basis, and having access to the most number of potential buyers to seize the best possible chance of maximising the sale potential of the item concerned. China (Imperial China and PRC stamps & postal history, PRC banknotes and modern bullion coins). Our proven history and track record of dealing with the most exclusive and sophisticated items, and our long-standing relationship with seasoned collectors throughout the world, put us in a strong footing for continued success and further future cooperation with YOU. 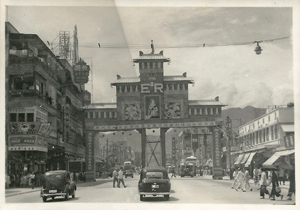 A photo showing Nathan Road facing Argyle Street in 1953 during the Coronation of Queen Elizabeth II. The place on the left behind memorial gateway is nowadays' Wu Sang House and HSBC Building Mong Kok.